Two years as Deputy Chief of Staff to Vice President Dan Quayle. Senator from Michigan 1995-2001. As Senator, fought to abolish the Department of Energy. 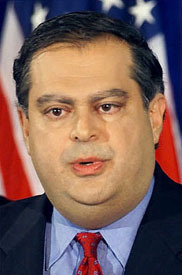 Appointed by George W. Bush as U.S. Secretary of Energy, 10 January 2001, resigned 2005.